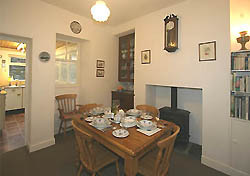 Holly Howe Cottage is a mid-Victorian terraced house built in the traditional local style with an added modern kitchen. 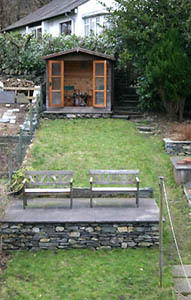 It is situated in a private cul-de-sac overlooking Ambleside and a couple of minutes walk from the centre of the village. There are excellent views to the south and west across the town to the fells beyond. There is parking for one car. 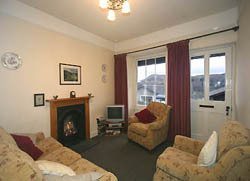 The house is centrally heated throughout and (apart from cellar, kitchen and bathroom) has fitted carpets in all rooms. On the ground floor there is a sitting room with comfortable chairs and sofa, There is a 32” television in the sitting room, this has Freeview Play catchup apps. There is also a DVD/Blu-ray player. There is a living-flame ‘open hearth’ gas fire. The separate dining room has pine table and chairs and a gas-burning coal-effect stove. There is wi-fi and there is a telephone for local and incoming calls. The house is available all year. Children and well behaved dogs are welcome, but please no smoking. The separate kitchen is fitted and well equipped with gas cooker, microwave, fridge, dishwasher, etc and all you need for catering. From here a back door leads to a small yard and the garden. There is also a cellar equipped with a small freezer, washing machine and tumble-dryer. The garden rises at the rear of the house, terraced in stone, below a lawn and a summer house, with plenty of room for al fresco eating. The house sleeps six. On the first floor there is one double bedroom with king-size bed, a walk-in airing cupboard and the bathroom with WC, washbasin and bath with Mira shower over. On the second floor the front bedroom has twin beds, the back bedroom has a double bed. OUR WEBSITE, phone 01749 676006 or email:jane@hollyhowecottage.co.uk.Terms are from £225 to £698 per week, according to season, and include gas, electricity, towels and bed linen. Bookings are from Saturday to Saturday..